Meet Sally, she's been busted. Sally is a little confused about being busted as you can see but still manages to crack a little smile in her blissful confusion. 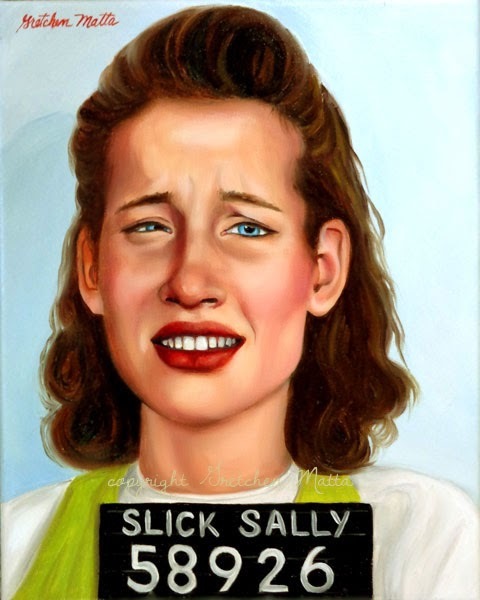 What did Sally do to get arrested? Maybe she is a thief, maybe a really good pick pocket, and a compulsive liar that has convinced herself she isn't doing anything wrong. I think Sally tells her family she sells women's accessories in a high end department store (and gets a discount on merchandise) and that's why she always wears new rings and bracelets. ...or this could all be a lie and Sally was just walking on the wrong street corner at the wrong time of night and started talking to these 'nice ladies' that were giving a lost man directions, who happened to be a cop. Poor gullible Sally. All images are Copyrighted by the artist Gretchen Matta ©2014.. Awesome Inc. theme. Powered by Blogger.